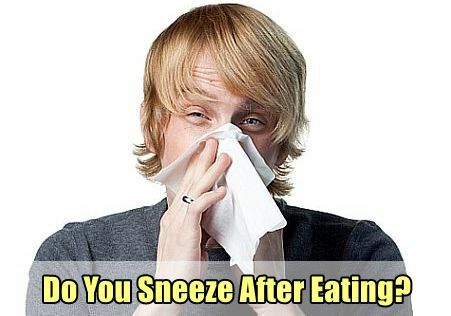 Sneezing After Eating - Why Do I Sneeze After a Meal? Do you know why same people start sneezing after eating a meal? Well, some people think that sneezing is a condition that only occurs because you have a cold. However, excessive sneezing after eating usually occurs due to an allergy to foods or to the ingredients in foods such as the additives. It can also occur to some other reasons, but before we get into the reasons that make you sneeze after eating, let’s briefly explain why a sneeze occur. Some people sneeze after plucking their eyebrows while some sneeze when exposed to the bright sunlight. Basically, sneezing occurs when the nerves in the mucous membrane lining the inner wall of our nostrils are irritated or stimulated. Sneezing is the body’s response to the cause of irritation with an effort to eliminate it from the body through the forceful act similar to blowing the nose. It is a reflex action that is beyond our control. 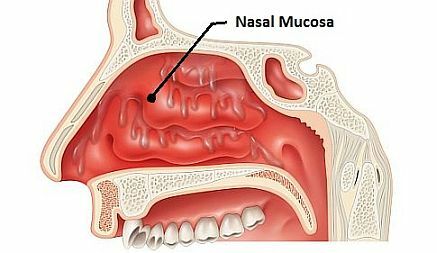 Let’s take a closer look to the different factors that can irritate the nasal mucosa and cause sneezing after meals. The most common cause of meal-related sneezing is food allergies. 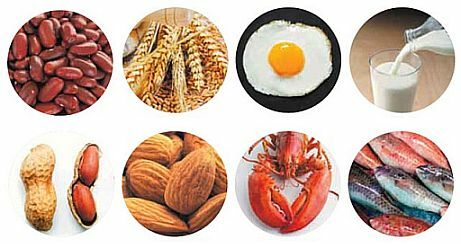 Many people complain of sneezing after eating chocolate, wheat, peanuts, seafood, milk, and eggs due to the heightened sensitivity of the body to them. The body triggers an immune response when a person eats these foods resulting in a series of symptoms usually beginning with sneezing. 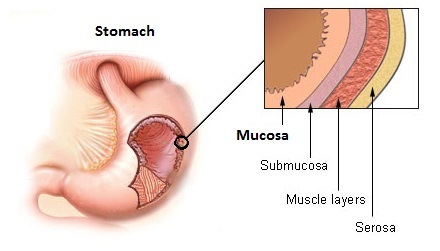 Sneezing after eating too much can be attributed to a distended stomach. When you eat too much beyond the usual capacity of your stomach, its walls are stretched. This causes irritation of the nerves within the mucosal lining of the stomach causing sudden sneezing fits after eating. This peculiar condition is called Snatiation, which is thought to be genetically linked. People with this trait often sneeze incessantly when their brain registers a full belly. The sneezing after overeating happens irrespective of the type of food ingested. It can be controlled by simply avoiding heavy meals, eating smaller portions, and eating more frequent meals. A person may sneeze after eating due to allergies hidden in the environment causing what is called allergic rhintitis. What does that mean? You see, particles may float in the air that can cause allergic reactions. You might get sneezing attacks in an environment with dust, pollen, perfumes, detergents, smoke, and fur of pets. These “allergic triggers” may be what cause sneezing after eating sometimes. Symptoms can often be more severe than just sneezing. To avoid this from happening, you need to study your environment and see if you find a common factor that triggers the sneezing every time you eat. Gustatory rhinitis is a non-allergic rhintitis causing congestion in the nose, continuous sneezing, and a running nose after meals. It usually occurs due to certain foods like ice creams, cold drinks, spicy foods, and alcohol as these can trigger a reaction in the nervous system that causes swelling of the nasal mucosa. People with allergic rhinitis or who smoke are according to a survey more likely to experience gustatory rhinitis symptoms. Location of the nasal mucosa. Keep a food diary – People who develop sneezing after eating due to an allergy do not get the symptoms after all meals. Hence, if you are experiencing the bouts just occasionally – that is when you have consumed or been exposed to the allergens – the cause is most likely an allergy. It can be avoided by keeping a food diary in which you can record the foods you eat. This will help you observe a pattern between the ingredients, food types, or methods of cooking and your episodes of sneezing such as sneezing after eating bread or nuts. This will help you identify substances that could be the allergen for you. The next step is simple; you just need to avoid those allergens! Change Eating Habits – If you notice that the attacks are accompanied by a feeling of fullness in your stomach, then you can try eating smaller meals at frequent intervals. This will prevent the bloating of your stomach and the resulting stimulation of the nervous system to sneeze. Nasal Irrigation – Irrigate your nose with sterile water using a squeeze bottle or bulb syringe. A daily nasal lavage will help to flush out the irritants and prevent the allergy symptoms. Drink Water – Increase your water intake to keep your body well hydrated. This will prevent the dryness and irritation of the mucous membranes. Inhale Steam – A hot bowl of water is enough for this. Just sit over the bowl and use a towel over your head. This can loosen the mucus in the nose and reduce the congestion. Keep It Clean – Keep the dining area clean and free from suspected allergens like dust. See a Doctor – It is obviously a good thing to consult with doctor if you feel that you can’t control the discomfort of sneezing after eating. The doctor may prescribe you a nasal spray or maybe suggest you to do a food allergy test. It can be quite embarrassing to sneeze uncontrollably when you are eating out at a restaurant or even at home with anyone around. Though this is not a dangerous symptom or a sign of any serious illness, it can cause a lot of discomfort and inconvenience. You can easily get rid of sneezing while eating by identifying which of the above-mentioned factors is causing irritation or stimulation of the nasal mucosa and taking steps to avoid them. Avocado Allergy – Can you be allergic to avocados?